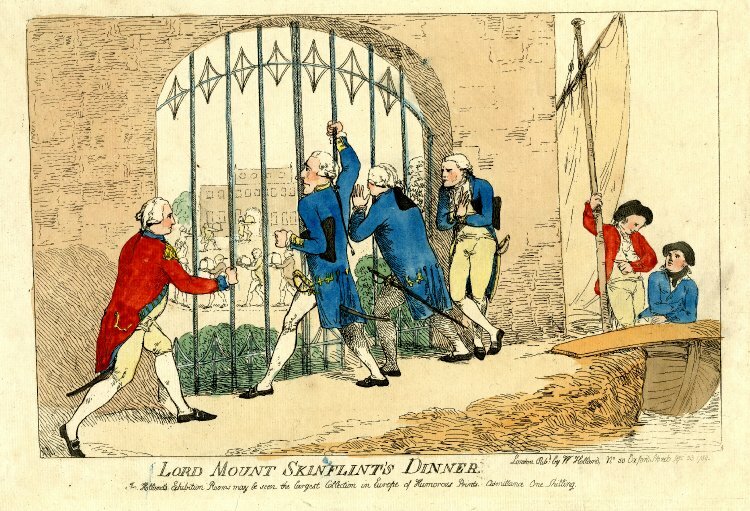 "Lord Mount Skinflint's Dinner," William Holland, 1789, British Museum. On 21 Aug. 1789 the royal party was escorted by a naval procession to dine at Mount Edgcumbe, where the officers also expected to dine, but were not invited. Fanny Burney records 'the rage of the sea-captains on being disappointed . . .' 'Diary', 24 Aug. 1789. Viscount Mount-Edgcumbe, who is probably the officer closing the gates (he had the rank of admiral), was created earl on 31 Aug. 1789. 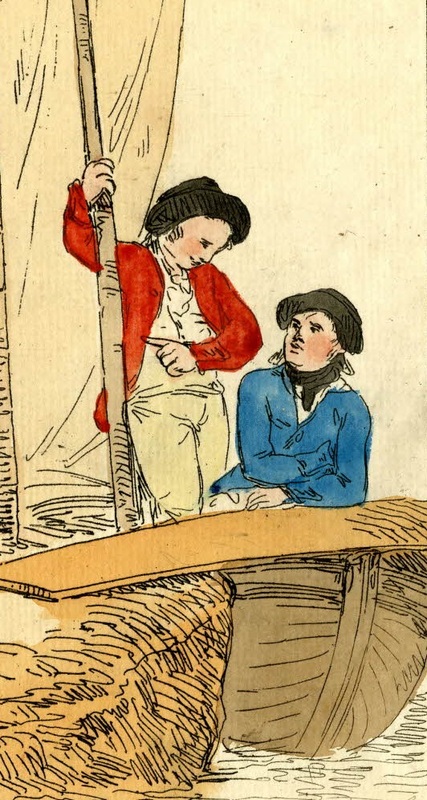 Two sailors in a boat look on with apparent amusement. Standing up and holding the mast is one sailor in a red jacket with buttoned down mariner's cuffs. He wears a black round hat with tall cylindrical crown (common for the late 1780's), and a white single breasted waistcoat that either ends at the waist or is tucked into his close fitting white trousers. A white neckcloth is tied about his collar. Beside him and leaning on the gangplank, his mate wears an identical hat and jacket, save for the fact that his jacket is blue. His neckcloth is black and tucked into his white waistcoat.